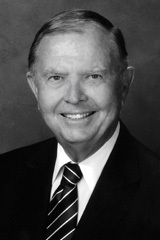 Gavin S. Herbert, Jr. is Chairman Emeritus of Allergan, Inc., headquartered in Irvine, California. Allergan is a global health care company providing eye care and specialty pharmaceutical products worldwide. Mr. Herbert, who helped found the company in 1950, had served as its Chairman from 1977 to 1995 and its Chief Executive Officer from 1961 to 1991. Mr. Herbert is also Owner/Chairman of Roger's Gardens, a large retail nursery in Newport Beach, California and the Chairman and Founder of Regenesis Bioremediation Products in San Clemente, California that manufactures and markets products for environmental remediation. Mr. Herbert is on the Board of Directors of Allergan, Doheny Eye Institute, The Richard Nixon Library & Birthplace Foundation, and Vice Chairman of the Arnold and Mabel Beckman Foundation. He is a Life Trustee of the University of Southern California. Mr. Herbert received his bachelor's degree from the University of Southern California and resides with his wife, Ninetta, in San Clemente.